Unlike other areas of the East Coast, here in Vero Beach, all has been quiet this week. We have had a few lightening storms, and some showers, but thankfully no tropical storms or hurricanes to speak of thus far. But don’t get too comfortable. If there’s anything we all know about weather, it’s that we never know when things are going to change. In a previous post here on our blog, we discussed portable generators and the correct way to use them. In this post I would like to discuss the importance of surge protection for your home or office. The first thing you should know is this, any device with circuit board of any shape or size will not react well to power surges. What is a power surge? In very plain English, power surge is almost like a big wave. When you are standing in the water at the beach and a big, powerful wave hits you, that overwhelming power will knock you over. A power surge is similar to a giant wave at the ocean. Printed circuit boards can withstand a lot, bit a huge power surge is too much for them. Most power surges only last a nanosecond or so, but that can sometimes be long enough to cause damage. 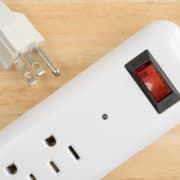 If a power surge is not particularly powerful, it may not fry your electronics, but it can still cause subtle damage, and if your devices are subjected to more power surges, ultimately they will cause failure of your computers, televisions and perhaps even your appliances. “A standard surge protector passes the electrical current along from the outlet to a number of electrical and electronic devices plugged into the power strip. 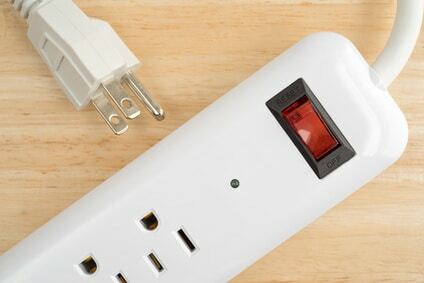 If the voltage from the outlet surges or spikes — rises above the accepted level — the surge protector diverts the extra electricity into the outlet’s grounding wire. I am certain Cliff has a much more detailed description of how a surge protector actually protects your devices, but for purposes of this blog, the above description is close enough. The bottom line is this, it’s a good idea to protect your electronic devices. Not only is it expensive to replace those devices, it’s also inconvenient. Give us a call and we can help you decide just what the correct type of surge protector is best for your situation.